DURHAM (WTVD) -- They say every dog has its day, and for K9 officer Prinz, that statement couldn't be any truer! Prinz, who has served with the Durham Police Department for almost eight years, retired this week. 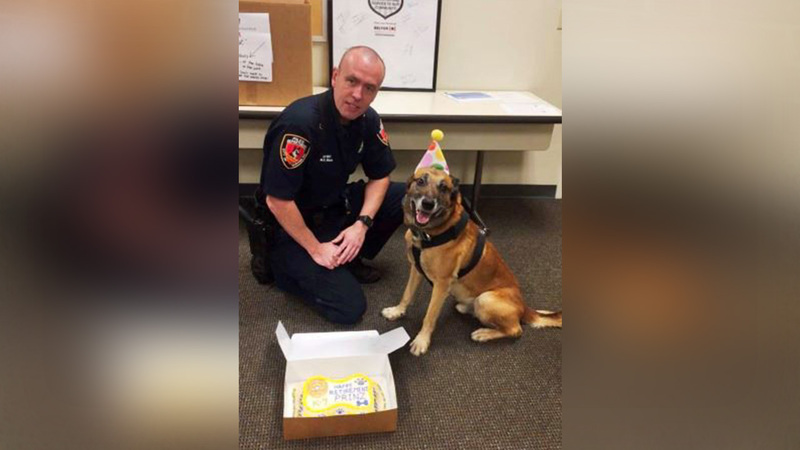 And to help celebrate his achievements, his fellow officers threw him a party, complete will lots of love, petting, and a retirement cake - of course! And by the look on his face, officer Prinz was more than pleased. In his time with the department, officers said Prinz has had much success. According to the department's Facebook page, he has assisted in locating more than 120 fleeing suspects and has recovered more than 200 weapons. The K9 officer has also had numerous drug seizures and has assisted in locating five missing persons in his career with the DPD. K9 Prinz will live out his golden years with his handler, K9 Officer M.D. Mues, and his family. "We wish K9 Prinz a long and happy retirement," the department posted on their Facebook page.